This is something I've been working on for the past couple of months. A DIY popcorn box for the holidays. Here's your chance to get the box & add your creative flair to it. Print it out on your computer to the size you choose & start from there. Use your favorite techniques, embellishements etc to add some holiday flair to your box. Then fill it with YOUR own SWEET TWEET interpretated your way. I am looking for technique, creativity & originality. Make me say WOW! There will be a SWEET Prize for a lucky entry! The winner will also get a button they can post on their blog to show others they are a WINNER! Sign up to be a follower of my blog & let me know that you did. If you have a blog post about the Challenge & include a link. If you don't have a blog, post this challenge to your peeps on facbook, twitter or forum online. Encourage your friends & family to enter the challenge too! Leave a comment @ the end of my post as a courtesty for the FREE Clip Art. 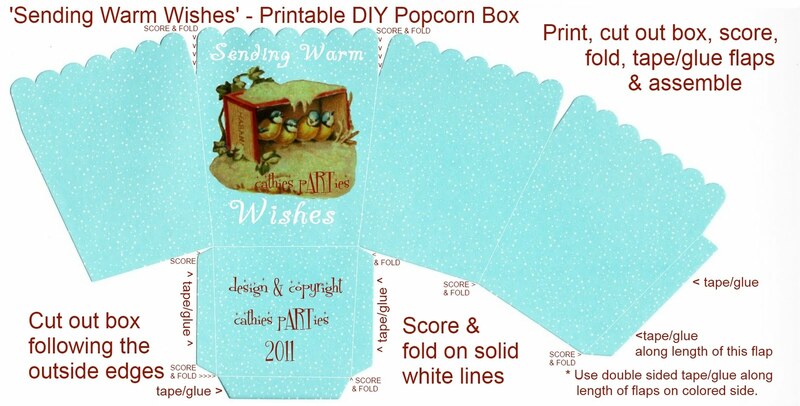 You must maintain the 3d popcorn box shape so that it will hold something. You have to fill it with something you would give as a gift & interpret the contents & theme with the Sentiment on the box - 'Sending Warm Wishes'. You need to bling up the box, don't just leave as is & fill it & think your done. 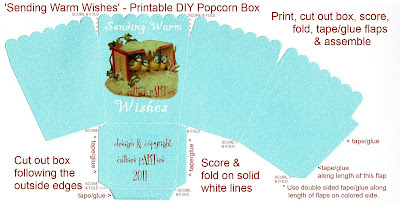 Add whatever you want to add some festive flair just be sure the popcorn box still looks like a popcorn box. The Sentiment & Clip Art have to be left intact, but you can use a technique/finish over it, just be sure the sentiment & image remains visible. You don't have to have a blog to enter there are other ways of getting around to post your entry here in the challenge. To enter you don't have to have a blog to link to. Just leave a comment @ the end of my post including your email. I don't publish these comments I only use them to email you copies of my downloads after removing the watermarks then ask you to email me your submission. I also ask that YOU come back after receiving your FREE download & leave me another comment as a courtesy for getting MY clip art download/s for FREE - THANKS! If you have a blog I appreciate you sharing my link so others may join in this challenge for a chance to WIN. Invite your friends & family & make this a pARTy! By entering into this challenge I have the right to publish a pic of your entry on my blog. CLICK ON THE IMAGE TO ENLARGE FOR VIEWING. YOU HAVE TO BE A FOLLOWER TO GET THE WATERMARKS REMOVED FOR PRINTING A GOOD COPY. SO LEAVE YOUR EMAIL IN THE COMMENTS AS MENTIONED TO GET YOURS. Thanks! This is so cute! Love your site...just found it!